I'm going to take this time to talk about automobile tires... or more accurately, mounting the wheels. It's an important conversation. Recently I took my car in for a set of tires. The end result was horrific, and getting action was tedious and mind-numbingly frustrating. The lug nuts that hold your wheels on the car are intended to be tightened to a very specific value. Too loose and they're insecure. But too tight, and they'll over-stretch, weaken, break and/or damage the bolts; damage your brake rotors (resulting in a pulsating sensation when you brake the car); or even potentially damage the wheel itself. Losing a wheel or locking a brake is dangerous. But being stuck on the side of the road with a flat, unable to change it is dangerous as well. A properly fitted wheel is designed to be removed in less-than-ideal circumstances on the side of the road by an average person using hand tools. A torque wrench, improperly used, is worse than useless. It makes you believe things are correctly adjusted when they're not. And it's VERY easy to improperly use one. Many mechanics are at fault here. The most common failure is to use an pneumatic wrench to over tighten, then "check" with a torque wrench. MAJOR FAIL. You can NOT use a torque wrench to validate the tightness of a nut that has already been tightened to its maximum extent. In an extreme example, consider this: if I were to solidly weld a nut to a metal tabletop, and you use a torque wrench to check it for a torque of 70ft/lbs, is it "properly tightened"? The tool will say "yes", every time. Every. Single. Time. In fact, it doesn't even matter what value you're looking for. It will read whatever you want. And you can't use the tool to untighten the nut to verify this. That's not what the tool is for, and not how it works. To make sure it's right, you have to loosen the nut and do it again properly. First lightly fasten all of the nuts. "Half-torque" is the usual phrasing for "snug, but not tight". The important point is that when you go to finish it up and apply the wrench again, the nut must move. Otherwise, you don't know if it stopped moving at the specified torque. It's common sense, really. Then go back and tighten to spec. The spec is found in the owner's manual of the car, but references are available and accessible to any qualified mechanic. To tighten to spec, simply use the torque wrench to tighten the nut until the bending bar needle reads the proper value or the torque wrench clicks (depending on the type of wrench you're using). Go back and tighten them all to spec again. 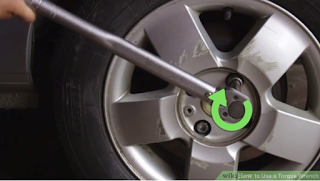 This is important because the wheel may shift a bit as all the lug nuts are tightened, and some that you thought were tight initially may wind up a bit looser the first time 'round. This WikiHow describes how to do it (almost) properly. I say "almost" because the pictures don't exactly match the text. They show improper gripping of the tool, and the discussion of using a bending bar isn't illustrated with a bending bar. But the text is correct. Many "professional" resources gloss over step 1, presumably because it is common sense. You use a wrench to tighten, not to check. I took my car into a professional tire center in December and got two tires. These were placed on the back wheels, and those wheels were moved to the front steering axles. This is normal procedure which prevents fishtailing on wet roads. My intent was to come back the next month and get the other tires replaced. The tires had other ideas. Although my tread was good, in January the valve stem gave way on my driver's side front tire. When I tried to change the flat, I found the nuts over-tightened an extraordinary amount, to the point where the nuts wouldn't come loose. Keep in mind here that the recommended torque for these nuts is 77ft/lbs. I then sprayed them down with penetrating oil and waited 12 hours before trying again. I applied well over 300ft/lbs using body weight and a lever before my lug wrench shattered. After buying a new, larger carbon steel wrench, I tried again. To remove each nut I had to apply full body weight with greater leverage using the larger tool, and another person using a lever. Well over 300ft/lbs torque and several minutes labor were required to remove each nut. I mounted the half-spare and took it back to the shop. I showed it to the shop manager, who told me that they always use a torque wrench to prevent such problems and, "Here's your problem. This wrench is made of cheap metal". Well, NO. That's NOT the problem. But it did tell me that they don't know how to use the torque wrench. The problem was over-tightened nuts which made it necessary to apply enough force to far exceed the operational limits of the wrench and shatter it. I bought the two remaining tires and told him to loosen every nut on every wheel and re-tighten them properly. When the job was done, the mechanic came to see me, re-iterated that they always use a torque wrench to prevent such problems, and again pointed out the metal of the wrench. AGAIN, NO. The wrench gave its life to a task made futile by unconscionable maladjustment. That would have been the end of it had I not received a message from them asking how I enjoyed my visit. I responded that I now feel the vibrations of a warped brake rotor and will not return, but thanking them for the follow-up. They responded yet again that they use "torque sticks" to prevent these problems, and that they'd be happy to correct the problem. Sigh. As you can see, I'm assured once again that your techs use torque sticks. This lead me to write this letter, because the implications are astonishing. It's undeniable that my lug nuts were tightened with excessive force. The amount of force is inexcusable. And yet, I'm told for the third time that the torque sticks are in use. Well, I don't deny that they are. But there is no way, no how, that they could have possibly been used properly. The laws of Physics forbid it. 1. You're attempting to limit liability. No problem there, as I have no intent of suing you. I call this a "lesson learned", and will go elsewhere. If you can't admit that there's a problem, then we can't have a serious conversation about fixing it. 2. You honestly don't know that there's a problem. If so, you've got a far bigger problem, because there are other people who use your services, and they're the ones in danger. This situation could have been avoided by simply saying, "Ooh, that's a problem. We'll administer refresher training on the torque sticks." But not once did I hear that there even was a problem. I've been assured several times (in person and in text) that you're using the tools to "prevent the problems" I had. Obviously, I still had the problems, so how can that be believed? Please imagine this: You eat at a restaurant, and get food poisoning. You tell the manager about your nausea and fever, and you've also got good evidence-based reason to conclude that they're not storing food properly. The manager and the cook assure you that, despite any evidence you may see, they're doing everything properly, and the problem must have been with your fork. The manager then offers a free meal to make it right. Would you eat that meal? Me, neither. PLEASE train your folks. They need it badly. David, Thank you for bringing your concerns to our attention. I appreciate your comments and the time you took to let us know. Rest assured additional training will be done. I have 12 years experience working for a major automotive manufacturer. The company described in the above is a local tire retailer with two locations in the Spartanburg, SC area. Because of their promise to retrain, I'm not naming them here; however, I won't be using them again. However, I can strongly recommend Firestone, Midas, or NTB, all of which have done excellent work for me.